“One that can stay in your room when you are at school and bite your little brother when he comes in to rummage through your stuff?”Total coffee choker there!There’s something Vera-Ellen-y about the blond on the left, and something Kathryn Leigh Scott-y about the brunette on the right. I covet that dress on the left. Preferably a version without the ruffle would magically appear for me. Oh, man–Miss Laced Pigtails has a serious Mean Girl vibe going on. You just KNOW she’s got rocks in that handbag, and she knows how to use them.Maybe it’s a Jekyll and Hyde situation. Miss Green Dress is the docile student body president by day; Miss Laced Pigtails is her after-dark alter ego, the hired gun. The girl in the gray dress does have the Mean Girl look. Ouch. Cute dresses. Frightening! there is sorta a Mary and Violet (from It’s a Wonderful Life) thing going on here. I always thought Violet was just this side of being a mean girl. Anyway, this looks like some after church drama is about to play out, because Billy was giving Green Dress more play in Sunday school. The dresses are cute, but I LOVE the shoes on “green dress girl.” Strappy, spunky, and with a LOW heel! Send me those shoes! My real live doll better have rocks in that purse because you do NOT want to know what I did to my Barbies…darn her and her unattainable body! 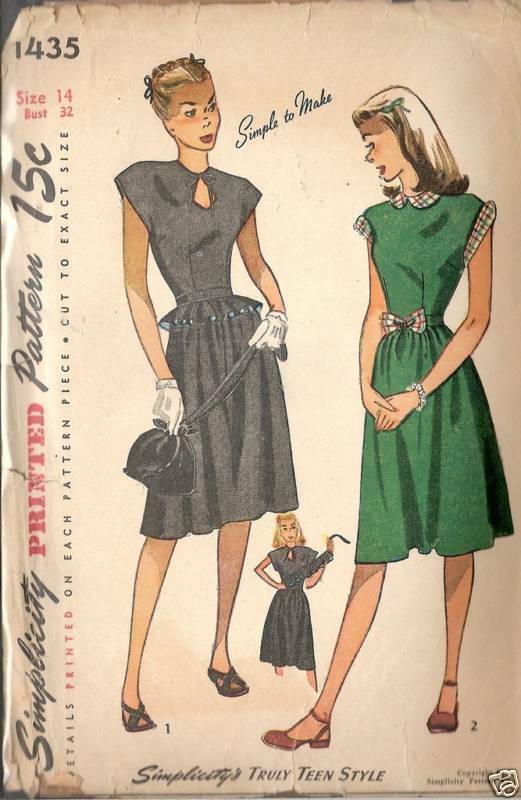 I like the gray dress with the removeable peplum; can totally see myself wearing it.If I had a real live doll, it wouldn’t be as scarey looking at those girls. Yikes! Maybe pattern art is where artists who could draw hands and feet but not faces end up. I gave Barbies makeovers with Sharpies and nail polish (applied to places other than nails). Lots of Eighties punk Barbies at my house . . . I still say it was a major improvement. Although, if Barbie clothes had been like the clothes on here, I might have been nicer to them. I love the peplum belt idea! It could be added to just about any fitted dress with a straight skirt. Will have to reverse-enginner it and try it someday.